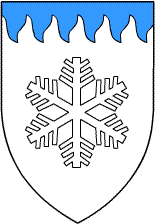 Proposed Arms: Argent, under a chief rayony azure, a snowflake proper fimbriated sable. We thought Terra Australis Incognita was a great name for our incipient Shire (which is what we were at the time); it was the period name for Antarctica, and we could prove it. A lot of thought went into our arms, too: all you can see down here, apart from the buildings, is snow. And we put the the chief in there because we thought it looked a lot like icicles. Snow and icicles, icicles and snow. It was the perfect representation of the terrain. We even "fimbriated" the snowflake (drew a line around it) because we knew the Heralds would object to a white snowflake on a white field. Regarding the proposed name of your group, you have failed to include a group designator (such as "Shire," "Canton," or "Riding"). Furthermore, as you have so kindly documented, Terra Australis Incognita was the name of a place which actually existed within the SCA period, therefore it is inadmissible as the name of an SCA group. Even if it were permitted to register existing place-names as the name of a group, nobody lived in Antarctica during the SCA period, so to claim that there were would be contrary to historical fact. And as to the proposed device: you can call the snowflake "proper," and you can fimbriate it, but that doesn't make it any less of a white-on-white charge. Try again (and you might as well know in advance that a "polar bear in a snowstorm" isn't going to cut it either). 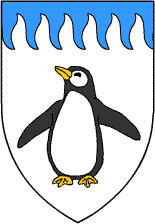 Proposed Arms: Argent, under a chief rayonny azure, a penguin in full aspect with head to dexter proper, beaked and membered Or. Although we commend your attempts to foresee and address our objections, we are also not in the habit of registering the names of places known in period to be fictional. The successful registration of the Middle Kingdom's name is not applicable to this situation; it was registered before the current system of rules was developed; furthermore, the phrase "Middle Kingdom" is descriptive and (as you yourselves pointed out in your documentation) not unique to a single place and time. You have made progress in your device submission, but the new version is not without its own problems. Although we do not contest the fact that the species probably existed within the SCA period, you have provided no evidence that the Antarctican penguin was known within western Europe before 1600. Further­more, the word "penguin" was used until the 19th century to refer to the Great Auk of the North Atlantic, a species of bird which is now extinct. As the penguin you have depicted is a modern (Antarctican) penguin, and not a Great Auk, we are forced to reject your device submission as well. Proposed Arms: Argent, a chief rayonny azure. As Sam Gamgee's old gaffer always used to say, "Third time pays for all." For a long time, we gave up on trying to get a device passed. First, we lost a lot of people (usually, you're only down here for six months to a year, two years at the very most). But we've steadily been building our numbers up, to the point where we're several people over the minimum required to have a Barony; and our fighting practices and ArtSci classes are very well attended. So we decided to go for Baronial status. Our personal Waterloo: getting our name and device passed. Why didn't it hit us before? Use the argent field and chief rayonny azure, representing snow and icicles, and nothing else! It's perfectly valid heraldry - in fact, if you go look at period examples, they often had just a field division without any things. 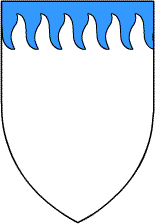 So we went and checked the SCA Ordinary and Armorial, and discovered that there's exactly one person in the SCA with an argent field and a chief rayonny azure, and there are more than two major differences with our minimalist device. So, hopefully, we'll have our arms and name passed and can be on our way to taking "(Incipient)" off all our Web pages. In thirteen to sixteen months. Update: this name and device actually made it all the way to the Society level, probably so that it could be publicly shot down by Laurel King of Arms. Southern Wastes, Barony of the. Branch name and device. Argent, a chief rayonny azure. Submitted as Southern Wastes, Incipient Barony of the, the status of Incipient should be removed from this submission as the College does not track this status. Populous Pole. There is little populace to poll at the pole, and Corpora III.C.6 requires 25 subscribing members. http://www.thequarter.org/SouthernWastes/officers.html implies that the group is padding their membership with penguins. For example, it appears that the baron is an emperor and the librarian is a macaroni. Populace Poll. There was no populace poll in support of the name or device, as required by Administrative Handbook section IV.C.5. Paper. No forms, fees, or documentation were provided for this submission, as required by Administrative Handbook section IV.C.1, IV.D, and IV.C.2. We did receive something which might, at one time, have resembled forms; we suggest that the branch use waterproof colors and better refrigeration. The College accepts checks and money orders in US currency; despite the presence of Pelican Queen of Arms on the CoA roster, we do not accept payment in fish. Laurel Wreath. Branch arms are required to use a laurel wreath, per Administrative Handbook section II.D.2. We realize that vegetation is scarce in this branch. A picture of an acceptable laurel wreath may be found at the end of the Glossary of Terms, at http://www.sca.org/heraldry/coagloss.html. Better views of the leaves may be found in the spice rack under "bay." Clock. Per http://www.thequarter.org/issue20/page01.php, The Quarter owes Laurel Clerk and Keeper of the Records one official Quarter clock, and it has yet to be delivered. If you are unsure what is required either for documentation for a submission or in summarization in a letter of intent, I direct your attention to the Administrative Handbook (section V.B.2.b), the December 2002 LoAR Cover Letter secion "From Pelican: Inadequate Summarization of Submissions", and the November 2001 LoAR Cover Letter section "From Laurel Clerk: Things Missing from LoIs". We wish to note that the depiction of the rayonny line on the chief is one of the best that Wreath and her staff have seen during this tenure, as depicted at http://www.thequarter.org/SouthernWastes/heraldry.html. However, we advise that any resubmission draw the chief somewhat deeper. It should also be noted that resubmissions must always address every reason for return. For more discussion of the Web site http://www.thequarter.org/, please see the cover letter with this LoAR. Our Seneschal wrote a point-by-point rebuttal in Issue 23 of The Quarter. The Heralds remained unmoved.